Fair warning, I plan to act as though I haven't noticed that it has been a year since I have posted anything to this blog. Busy isn't a strong enough word for this last year, perhaps overloaded, perhaps buried, or perhaps I need a new thesaurus... perhaps. There have been several woodworking and hand tool related happenings since last March which I am now ready to put into digital print. Not that I have any more time now than before, but I did buy a really sweet day planner. I feel I should start with the most recent item and work my way back in time. A short time ago, I wrapped up a project which required me to draw on a lot of past experience, and to experiment with some new techniques. 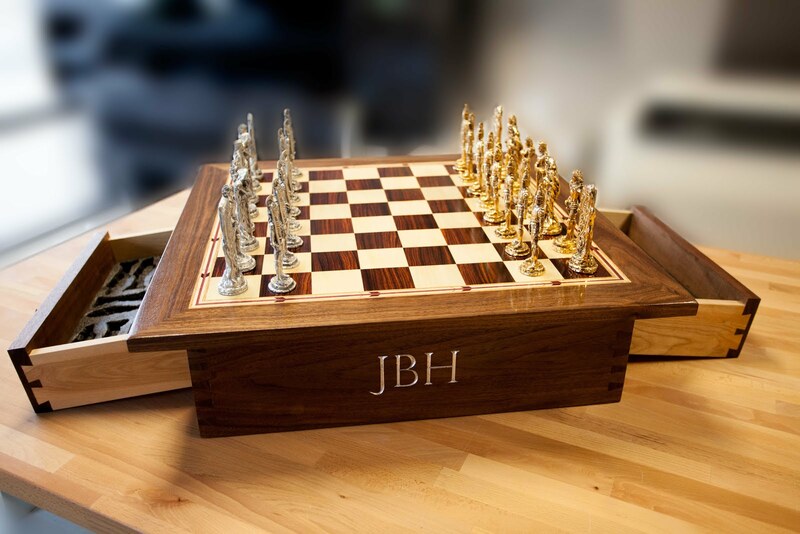 The chess board in the photo below was a lot of fun to build, though it was not without its frustrations. There were many lessons learned which I'll get into as my summary of the construction proceeds. I'll provide my step by step construction in several blog posts over the next week or so, as I am able to squeeze in some free time. The casework is solid walnut with beech drawer sides with hand cut dovetail joinery (both through and half blind). 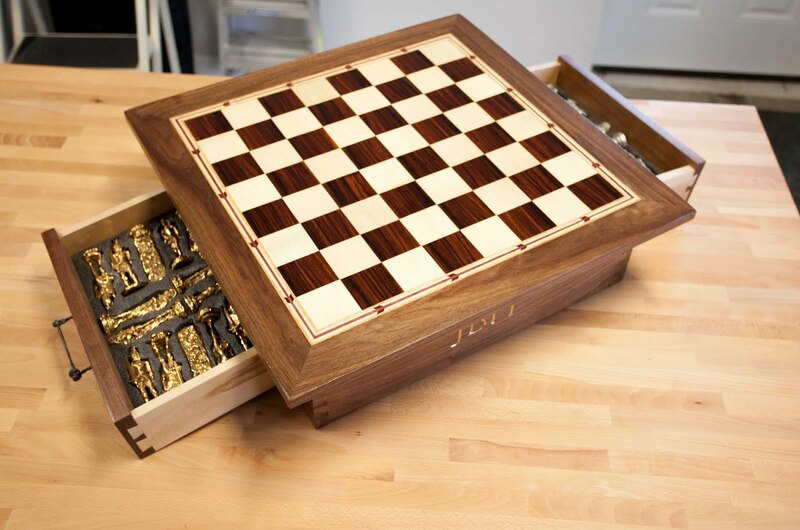 The chessboard is shop sawn veneer in cocobolo and holly with shop made banding and a solid walnut border. 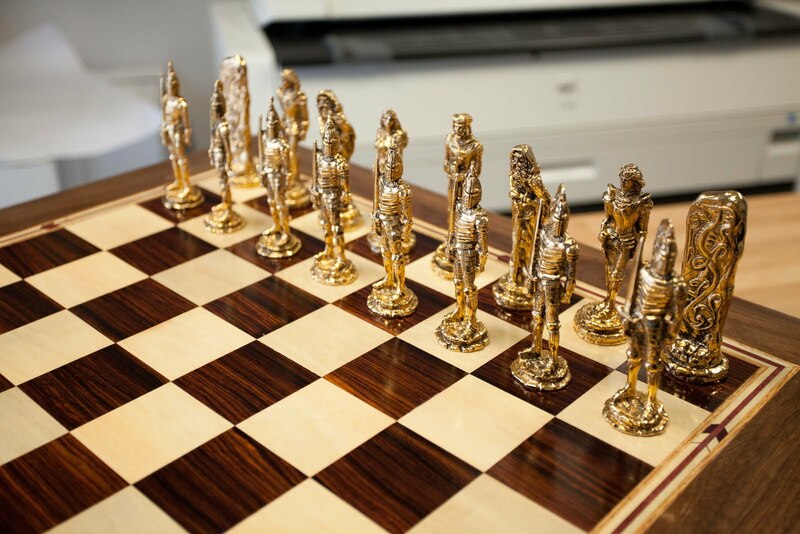 The beautiful Arthurian chess pieces were made by K.Dopita Studios in Colorado Springs, CO and inspired the King Arthur/Excalibur theme for the board and case. The banding which surrounds the playing field depicts arrows following one another, and is made from purple heart, holly, and oak. 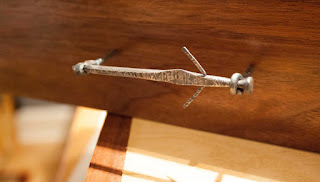 I forged tiny swords from cut nails for the drawer handles, a fun process which I'll write up as an individual tutorial. 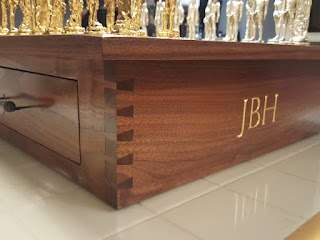 I carved initials on both sides of the casework and gilded one side in gold and the other in silver to play on the opposing pieces. The playing field is veneered using Old Brown Glue, a liquid hide glue, and the remainder of the case uses hot hide glue. I wanted the piece to be repairable, as it is intended to be an heirloom set. 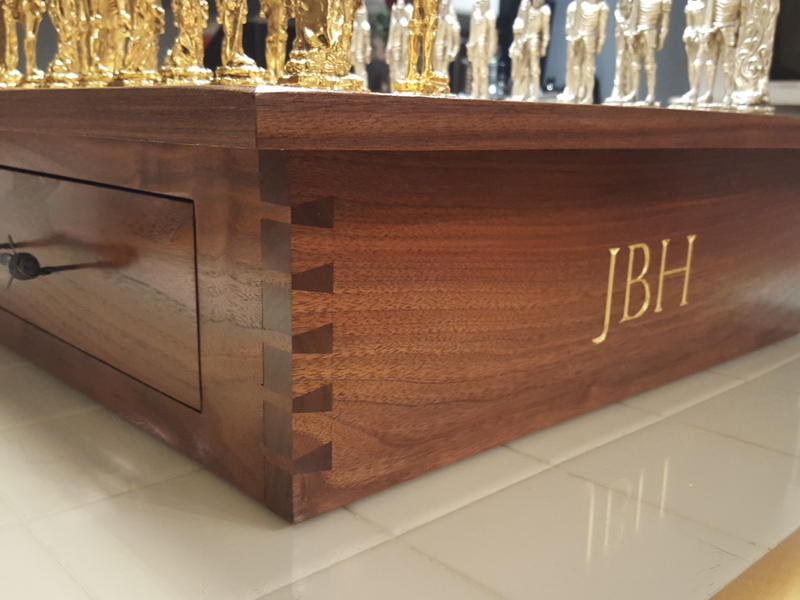 The finish is dewaxed blonde shellac from Brooklyn Tool & Craft. The case received three or four coats while the top received a french polish because I wanted the reflective surface. Mixing and working with shellac has now become something of an obsession. The possibilities are endless, and the textural feel of shellac is very different from urethane, my prior finish of choice. The entire piece received several coats of Renaissance wax prior to delivery. The board's recipient was very happy with the final product, and I am thrilled that it is going to get plenty of use!